Holy Schnikes! Its a Groupon at Tinatapas! Get It While Its Hot! Hey there folks! Jerm here with another fine Tampa Bay dining update for you guys on what is not just the deal of the day, but rather the deal of the century! The fine folks over at Groupon and Tinatapas put their heads together and came up with an awesome daily deal package for you guys! 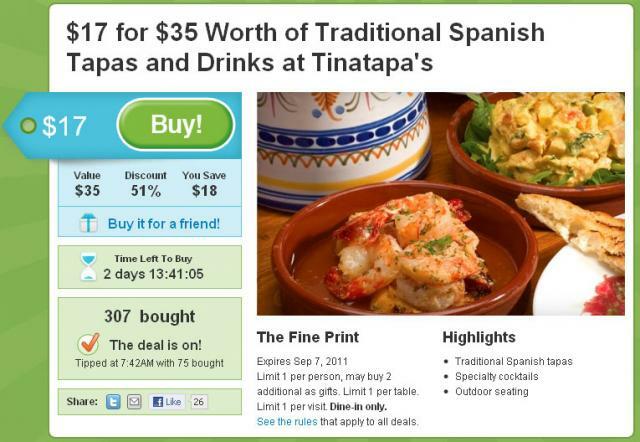 For just $17 you can get $35 Worth of Traditional Spanish Tapas and Drinks at Tinatapa&apos;s! For that low a price, I say you just go ahead and get one for yourself or if you are feeling generous, get some for your friends and family! I know how much all of you guys love Tina given you guys went bonkers (in a good way of course) a few weeks back when we did the Valentine&apos;s day giveaway, so this is another chance for you to have a little taste of Spain while taking advantage of a great offer! So what are you waiting for folks! I already purchased my Groupon this morning so hurry up and get yours! Thanks for the folks at Groupon Tampa and Tinatapas for making this deal available to us! Now for those of you that would like to learn more about the Groupon process, check out the site at the Groupon Works site. If you or your business are located here in Tampa Bay and interested to learn more about making Groupon work for you, just contact our awesome local Groupon rep Jessica Dwyer at jdwyer@groupon.com! That&apos;s all for now folks, but stay update to date with us as we send you more info about Tampa Bay dining related daily deals and other tips on things to do in Tampa Bay!